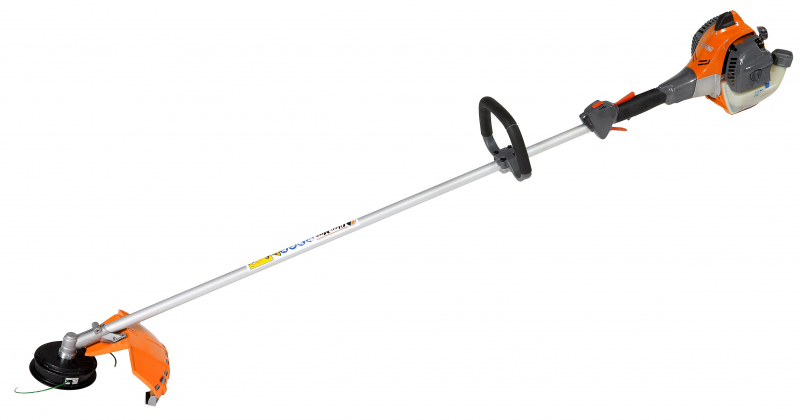 This brush cutter is a tool for the professional but will work superbly for all users. This product constitutes a turnaround for the market by introducing new quality standards that will be hard to relinquish once experienced, both in terms of performance and user comfort. Designed for the most demanding home user and for maintenance professionals responsible for the upkeep of difficult green areas. Thanks to a power weight ratio that is unequalled in the category, plus ultra compact dimensions and a perfect combination of power and manoeuvrability. 21.7cm3 1.2 HP (0.9kW) 2-stroke engine featuring generous torque output with a in ear power curve even at low revs. Piston with 2 rings, die cast cylinder with nickel plating, forged con rod and crankshaft guaranteeing an extremely rugged and durable engine. Digital coil with electronic control and revs limiter for easy starting, improved performance thanks to consistently uniform combustion and deuced fuel consumption.